I've gotten this question a lot lately, so decided to just make a post about it: "What are side gigs I can do to earn money while transitioning careers?" I will list out all the ideas I can think of here and more details for the ones I know about. Why do I know about these? I needed some of these when I switched from medicine to software and did some on the side on night/weekends. I have friends with flexible work. I traveled a lot for work and talked to people around me. Sometimes I was on the customer side. And, reading PennyHoarder for kicks. The list below will be mostly applicable to US residents. Some of this is available in other countries/regions, but I live in the US and can provide a list that is useful for where I live. If you are a good writer, don't mind driving, or are bilingual, you will have lots of options! Google Ads Rater - look at google search queries and see if the results are good, see if ads graphics are related to the text topic, see if queries for videos bring back a good result video, etc. To do this, basically apply for a spot within one of the below companies, wait for them to select you, you start taking exams from them based on material they send you (usually a large-ish PDF manual), pass tests, start doing work. It can be a bit brain numbing but easy money around $13/hour that you can do while watching Netflix. It's not very intensive or hard as long as you are good at absorbing the rating requirements that were taught in the training manuals. Note historically there were 4 companies when I did this 5 years ago, it looks like in 2019 it is down to 2. LionBridge - Current Job Openings (click on testers, raters, and curators for Google Ads rater jobs, if you are bilingual you can investigate the translator or interpreter options). Appen Butler - Current Job Openings (click raters for google ads, or if interested checkout language jobs or micro tasks). Leapforce has been acquired by Appen. ZeroChaos <-- I believe was dropped from Google in 2017 due to this article. VIPKID Teachers - teaching English via online conference call to children in China. Need to be very enthusiastic and require a Bachelor's degree in any field and to be in the US or Canada. Amazon Turk - basically random tasks people need a person, not a robot to do. It could be literally anything manual, reading/writing/recording audio, analyzing, testing things out, checking grammar, translating, making subtitles, you name it. You can screw up and make like $1 an hour picking low paying tasks, or as much as $20ish an hour. I believe most folk average around $10 an hour. Do your research based on the links below and do your own research before embarking on this one so you know how to earn a decent hourly wage. iTalki - If you can speak a foreign language and want to teach the foreign language, or teach English to those who know the same foreign language as you, this is a top notch website. I used this site as a learner to learn a foreign language and its a reliable and well put-together process. You sign up as a tutor, put up your schedule, and people sign up for lessons with you. You do lessons via Skype video typically, unless you and the student agree on a different video conferencing program. You can teach in any way you choose, come up with your own materials and plan based on the student. Freelance Writing - I don't know much about this area but just giving this as an idea. Translator - I don't know much about this area but just giving this as an idea. 20|20 Research - You fill out a survey to see if you qualify, if so, you do something like answer questions on a forum for 2 hours and get around ~$80-250. Note: I applied for like 10 of these over a 3 year period and didn't get accepted once, so I quit trying. My mom applies to these things and regularly and gets accepted all the time, so I have no idea what makes someone qualify for these but I know it is possible to get accepted often if you are a certain demographic or answer the questions right. Bartending - find a local bartending job at a hotel or restaurant. The more expensive the joint, the better the tips will be. Mystery Shopping - You get paid to pretend to be a shopper and make sure employees are doing what they are supposed to (coffee at the right temperature, introductions, talk about some sales/rewards program, checking IDs for alcohol, etc.). Typically you get reimbursed for whatever item you buy and a payment for your time for doing the task and writing up a report. You need to have decent grammar/writing/spelling skills and do a good job on the report. If you mess up the report, you won't get paid or reimbursed, so be careful, but most people who are very meticulous will have no issues with this. Typically you pay for items with your credit card and are reimbursed, so you need a credit card and have to be ok with a reimbursement coming 7-90 days later. A Closer Look (restaurants, fitness. ), Second-to-None (donuts, blood, urine tests), Mercentile Systems, and North Fork are reputable companies. There are a lot of scam companies out there, so be careful and do your research before you start doing this. Pet Sitting - you either visit/stay at someone else's place or take in their pet to your home. There are websites that are local to your area and more national reach ones, search for pet sitter on google and you can checkout options for your area. Dog Walker - walk dogs! Google this and find out what you have locally, etc. Donating Blood Plasma - you can donate 2x a week (~$20-50 per visit), the payment varies by location. You can google based on your location for locations to donate plasma. Focus Groups - Usually target some specific demographic, if you are in it, apply! Mostly one and done, you apply, if you get in, you do some task, easy money, and they pay you right after. Herron Research projects - Opinion research studies for Indianapolis, IN and Tampa, FL. Uber - rideshare option, drive folk around on your own schedule. Most people join both Uber and Lyft to make sure they get rides from both. There are a lot of strategies to get the most rides, rush hour, weekend nights, and hovering around the airport are all good ideas. You do often wait in a queue if you are in an airport or busy location like that. Stick to downtown areas for weekend nights if you want the bar scene, also wrap up your car with plastic wrap in the back and provide doggy bags in case of sick folk who drank too much if you do this. Lyft - rideshare option, drive folk around on your own schedule. Same advice as above for Lyft as Uber. InstaCart - food delivery or in-store shopper, sometimes the same person does both, but usually these are two separate jobs. One last note, a pretty good website to come through for more ideas is The Penny Hoarder. I created some training material for the IIBA (International Institute of Business Analysis) local Tampa chapter and it is open for anyone to utilize. I have am working with them to help with training in using Azure DevOps (formerly VSTS/TFS) and for new folk to the field. I would recommend getting the Scrum.org and the ECBA certification from the IIBA. The best way to go for the ECBA certification is to pay for the membership for the IIBA which will give you lots of training materials and an exam discount (about the price of the membership so it's like free materials!). Go to local meetups and search for IIBA in your area and find some nice folk to ask about the field and what the job is like! 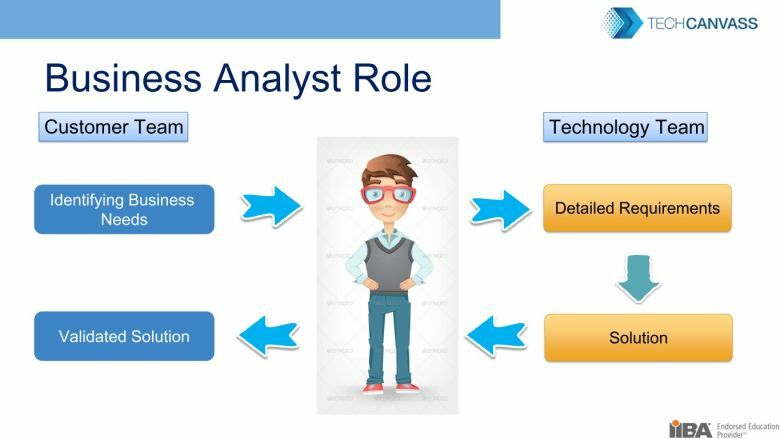 When searching for jobs make sure to search for a generic "Analyst" as there are many, many names for Business Analysts. Also add in keywords for "entry level" or "junior" and don't be afraid of the requirements or years of experience they ask for in the posting, that is simply a wish list of an ideal candidate, not a real person that they actually plan on finding (especially for junior roles). Write a cover letter explaining why you are interested in the Business Analyst role, why you are a good fit, what you have done to prepare yourself, what skills you have, and why you are interested in the particular company you are applying for. On the top of your resume, list skills that are relevant to the IT field and the Business Analyst role. Members of local meetups or industry Analysts can help you out! I have some training on how to write Epics/Features/User Stories and examples of how to break things down. I also have hands on labs on how to utilize Azure DevOps as a tool in the Business Analyst role. Azure DevOps is completely free to use for up to 5 people (so for 1 person learning, it's a great tool). The labs and info is all free and I just hope it helps someone out! Note: I am not a Business Analyst, I am a developer who has partnered up with Business Analysts to make this training. I do work at Microsoft and I do train Business Analysts on how to utilize Azure DevOps as a tool, but I do not train Business Analysts on how to do their role. A NIC on a VM can connect to your VNet for example. Properties of a NIC that are normally set in the OS are able to be configured in Azure for your Azure VMs. Note: VMs (and all other resources) need to be deployed to the same region as your VNet. So you need a VNet for each region that you have resources. A NIC on a VM can also be attached to a load balancer (for highly available applications). Up to 250 IPs can be assigned per NIC, and these can be public or private IP addresses. You can add/edit IPs by going to your VM resource > Network interface > Settings > IP Configurations > Add. If you select an existing IP address, you can go into another menu where you are able to enable it as Public/Private or assign it as Dynamic/Static. You can also change the actual IP address value for Static IPs. Changing to a new IP address will cause the VM to reboot. You can add more NICs to the VM if you need more IPs from a Microsoft block of reserved IP addresses (you cannot port in your own IP address ranges that you are using on prem or otherwise). The underlying Azure platform handles connections to/from the machine, you should not RDP into your VM and setup a static IP address for you IPv4 (you will lose access to your machine, it is an unsupported action for an Azure VM and well documented). You also should not install a DHCP service on your VM (unsupported as well). You can do dynamic or static IP addresses for your VM. Dynamic Host Configuration Protocol (DHCP) is a client/server protocol that automatically provides an Internet Protocol (IP) host with its IP address and other related configuration information such as the subnet mask and default gateway. MAC address persistence: by default we guarantee that the MAC address will not change for a VM or NIC provided the VM is not deleted, redeployed from disks, or redeployed using the redeploy feature that rebuilds the virtual hardware. When you create a new VM you can add it to an existing VNet and subnet. If you want it publicly available, you can add Public IP, or if you don't then select None for the Public IP address (and it will automatically get assigned only a private IP address). You should create a new NSG for it (default option). IP addresses are treated as a separate resource in Azure, which allows you to move it from one resource to another. Not all resources in Azure support a static (reserved) IP. For example, a VPN Gateway or Application Gateway do not support a static address because they are Microsoft managed resources. The dynamic IP will not change unless you delete or redeploy that resource, however. Static (reserved) Public IPs - retain the IP address. The IPs can be moved between services easily and within seconds. Public IPv4 resources are a finite resource. You can have 5 public static IP addresses as part of your Azure subscription for no cost, but any additional ones will start becoming a billable resource. Dynamic IPs can help you with cost savings as they are cheaper than static IPs. Azure data centers manage the physical hardware for you. You configure virtual networks through software, which enables you to treat a virtual network just like your own network. For example, you can choose which other networks your virtual network can reach, whether that's the public internet or other networks in the private IP address space. Virtual Network: logically isolated network on Azure that enables the flow of communication between different resources/subnets/VMs, other VNets, or to on-premises (depending on how you set it up). This is the foundation of Azure Networking and it is a Layer-3 overlay. Virtual networks are segmented into one or more subnets. Limitation of VNets: VNets cannot span regions or subscriptions. VNet Peering, ExpressRoute, or VNet-to-VNet can connect regions or subscriptions together, however. Address Space: usable IP addresses within your virtual network. Mainly an IPv4 environment. Public and private available. VNets are isolated by default. If you deploy two or more VNets in the same address space, it is fine as long as you do not intend to ever try to connect them. If you need to add multiple address spaces, go to your VNet resource > Settings > Address Space and add more. As you add more, you can make subnets from all added address spaces. Azure Reserved Addresses are needed for Azure core connectivity. /29 is the smallest and /9 is the largest you can use in Azure. Typically x.0.0.4 will be the first usable address space. Subnet: Subnets can help you organize and secure your resources. In the Portal when you create a VNet it has you define your first subnet, you can add more later or delete/modify the one you created initially. Network Security Group: controls ingress and egress traffic (allows or denies) to your Azure resources such as a NIC or subnet. Think of a network security group as a cloud-level firewall for your network. Prioritized set of rules based on a 5-tuple rule-set: source + destination IP, source + destination port, and protocol. Can expose only certain ports of a subnet or NIC to the Internet as well as secure the flow of traffic between subnets/NICs on the same subnet. Stateful rules and will keep track of your requests. Route Tables: A route table contains a set of rules, called routes, that specifies how packets should be routed in a virtual network. Route tables are associated to subnets, and each packet leaving a subnet is handled based on the associated route table. Each route table can be associated to multiple subnets, but a subnet can only be associated to a single route table. DNS Servers: References to DNS servers that will be assigned to the VMs or cloud server instances in the VNet. DNS resolution service is provided by default out of the box with your VNet in Azure. User Defined Routes (UDR): control traffic to a much finer degree. Send traffic to/from IPS or IDS for monitoring/auditing. 2. Setup RBAC for user access. 3. Setup a User Defined Route (UDR). 4. Setup a Network Security Group (NSG). 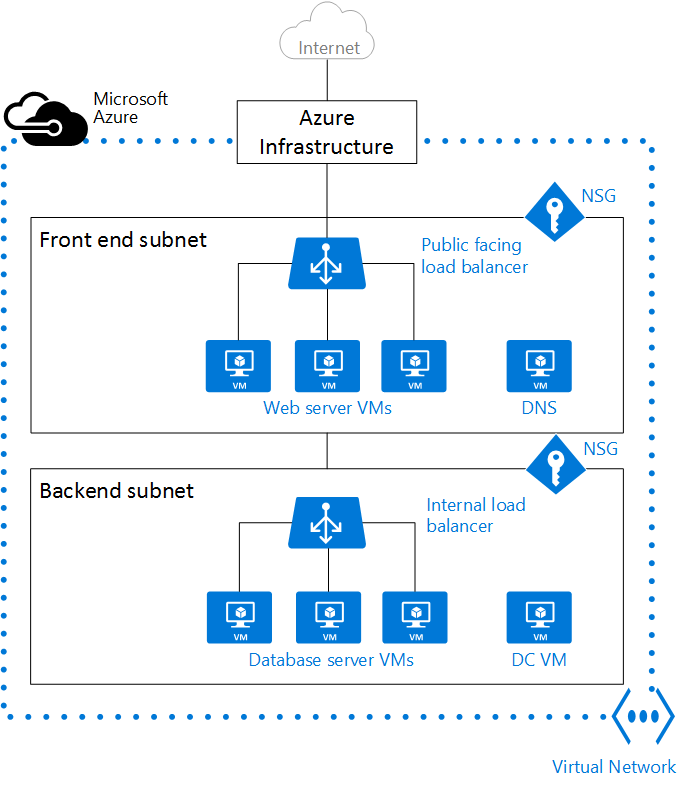 VNet Peering within Region - Connects two VNets in the same region via the backend network in Azure. No extra overhead with this and almost no latency. VNet to VNet via VPN Gateway - Leverages the Azure VPN gateway in each VNet to make the IPSec tunnel across regions or within the same region. Can also span to other customers or subscriptions easily. VNet to VNet via ExpressRoute - Associate multiple VNets to the same circuit. 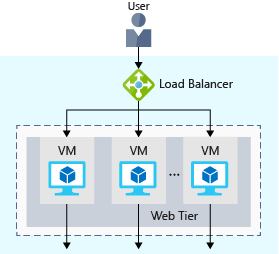 Behind the scenes, Azure will enable routing between these VNets and their different regions to all connect to each other easily. Could cause security concerns with default behavior, but can be controlled. Internet Connectivity - resources are public facing directly to Internet and you can connect from anywhere. While possible, not usually preferred by companies. Secure point-to-site connectivity - IPSec based tunnel that based from a client machine. Really good for individuals traveling and outside of the corp network and need to access private resources. Individual developers can use this. Secure site-to-site VPN connectivity - Most enterprises start here, simple IPSec tunnel over public Internet connectivity from your on-premises gateway and Azure. Connect to private IaaS and PaaS resources seamlessly, should just feel like an extension from your network. ExpressRoute private connectivity - Enterprise solution geared towards customer who need high throughput (~10GB range) / low latency connections. Dedicated direct connection from your datacenter to Azure (pretend there's a big cable going from your datacenter to Azure datacenter). Backed by SLA. OSI stands for Open Systems Interconnection and it was developed in 1974 by the International Organization of Standardization (ISO). It is a 7 layer architecture with each layer having specific functionality to perform in order to transmit data from one server to another. Part 1 (on your local laptop): When you request Google from a browser: The browser creates a GET request. The Presentation layer encodes it to HTTP/S. Session layer opens a connection from you and the server. The GET request gets put into a TCP packet. Then the Network layer figures out the next IP it needs to send it to, in this case your router. The Data link (my computer's Network Interface Card = NIC) converts it to electrical signals. The Physical layer transmits the TCP packet over the air from my computer to the router over WiFi (or to your router via a physical wire if you set that up). Part 2 (on your router):When the router receives the TCP packet, it's over the WiFi Physical layer (most routers today have WiFi built it, however it used to be a separate box). Then it has to translate this Physical layer from electrical signals (Physical) into bits (Network) with the router's NIC. Then the Network layer (router) figures out based on the destination IP address where to send it to next. It transfers the data back into electrical signals and sends it out the physical cable to your cable company and onwards. There are apps an end-user can utilize that will work at the Application layer. As an end-user you only see the interface Edge. The app itself, such as Edge, can utilize for example .NET Framework's HttpClient in order to work with the networking Application layer. (other browsers and things have other development frameworks that can work with the Application layer). I want to access https://www.google.com from Edge so this sends a GET request. All GET/PUT/POST/PATCH/DELETE requests are at the Application layer and are HTTP protocols. You need to download the HTML for the page google.com, so Edge opens a Session and requests and start downloading the HTML page in chunks. 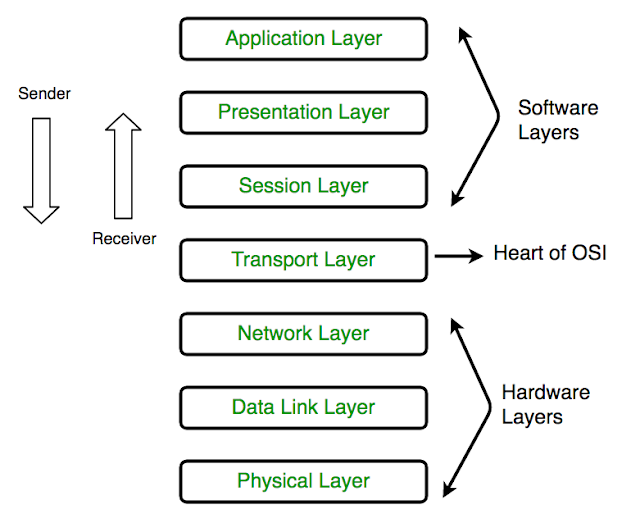 Presentation layer converts chunks of data from a network format to an application format, and vice versa. The Presentation layer takes care of encryption/decryption of the file, and combining chunks of the file as it comes through. There are multiple cycles of going through the software layers. The Transport layer is a connection between two servers, so in this case, your computer to Google's servers. Transport layer protocols are Transmission Control Protocol (TCP), User Datagram Protocol (UDP). TCP provides apps a way to deliver (and receive) an ordered and error-checked stream of information packets over the network. TCP is slower due to its error checking and needed if you want to ensure things (like files) are delivered without issues/errors. The User Datagram Protocol (UDP) is used by apps to deliver a faster stream of information by doing away with error-checking. This is used more often for video streaming or gaming where you need faster speed/performance and can handle a little bit of errors. The Network layer is IP and handles routing packet. A packet is a chunk of data. It will route data based on logical addressing. Routers are part of the Network layer because when you send something, there are multiple hops it must make, so the network layer handles determining which path the data should take (which hops to do) based on network conditions, service priority, and more. if there are traffic issues it can also handle switching and re-routing packets. The Data Link layer will translate the Physical to the Network layer (Network layer = electrical representation of data like bit patterns, encoding, and tokens). The Network Interface Card (NIC) works at this layer. 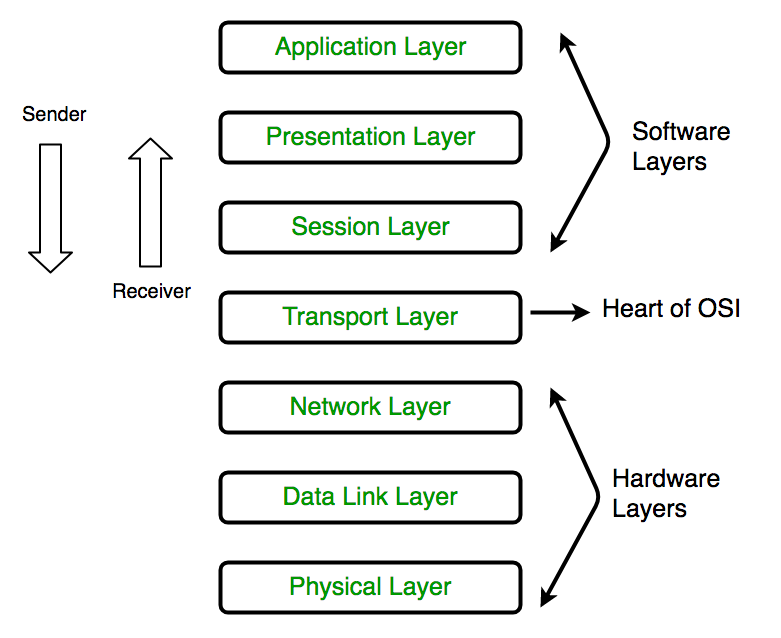 The Physical Layer is entirely hardware over a physical medium and connects computers via a physical link. It defines how a cable can attach to a Network Interface Card (NIC) by determining the number of pins a connector will have and the functionality. This can either be wired or wireless (Wi-Fi). If you know nothing or very little about networking, here are the basics! I am coming from a developer background and needed to learn this, so wanted to share from my perspective a 101 level breakdown of networking. A computer network is 2 or more computers that communicate with each other via some medium-- this medium can be anything (radio waves, wires, infrared, optical fibers, or others!). A network interface card (NIC) allows you to connect to a computer network. What is a Network Interface Card (NIC)? A NIC is a piece of hardware that connects to a motherboard, and will connect the computer to a network. The CPU will hand it data. The NIC takes the data from the computer, translates the CPU's parallel data into a linear form that can be sent via cables, and vice versa from data coming from the cables into the CPU. A NICs can connect to several different networks at the same time and manage which data goes to which network. Each Network Interface Card (NIC) gets an IP addressed assigned to it, which is the identifier of that device. What is an IP Address (IPv4)? 4 numbers (each between 0-255), separated by periods. The lowest IP address is 0.0.0.0 and the highest is 255.255.255.255. What does binary have to do with IP addresses (IPv4)? Each of these decimal numbers is called an octet (127, 16, 254, and 1 as shown below). There are 4 octets in an IP address. Each octet contains 8 bits and can be represented in binary. Take note that there are 32 bits, as we will talk about this more in subnetting. 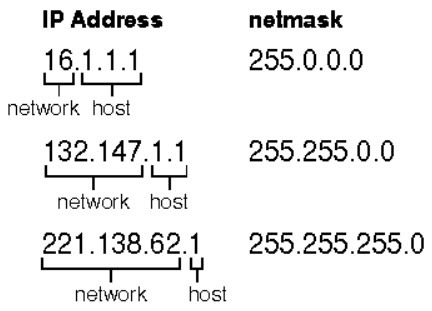 There is a network portion and a host portion of an IP address. There are different options for how much of a network/host ratio that you would like which depends on how many IP addresses you need to have available, we will talk more on this later. The network portion identifies a group of devices. 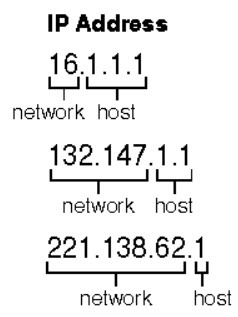 The host portion is the individual device on that specific network. You can have a zipcode 11111 and address 345 Cave Stone Road, you have identified one specific house. If you go to another zip code 22222, there may be another yet different specific house at 345 Cave Stone Road. The zip code is the network portion of an IP address. The actual house's address is the host portion of an IP address. What is a subnet mask (netmask)? 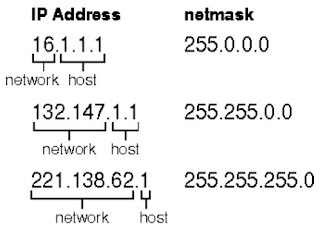 The subnet mask separates the network and host portions of an IP address an determines how many total addresses we have internally to use (# of host addresses). In all IP addresses, we have 32 bits that could be changed, because there are 4 sets of 8 bits, as seen above. Wherever there is a 1 in our subnet mask in binary, this is our network portion. This means that the network portion is the first 24 bits. Using CIDR (Classless Inter-Domain Routing), we could say this is a /24 length of the network prefix. If we were to look at the photo below where the IP address is 16.1.1.1, let's solve for the CIDR subnet value. Remember that in 255 in decimal is 11111111 in binary and 0 is 0. If we have 255.0.0.0 as our subnet, this converts to 11111111 00000000 00000000 00000000. The network portion is 8 bits. So it would be /8. What are the other two IP addresses CIDR values? See below the photo for the solution. How does this relate to how many IP addresses I get? If my subnet is /24, then I have 24 bits as my network portion and 8 bits that are my host portion. 8 bits can hold 2^8 values. There are 256 total addresses in my network. To get the total usable addresses you subtract 2 because there are 2 "special" addresses that cannot be used. To be specific in this example: 210.10.10.0 cannot be used because it is the zero address and 210.10.10.255 cannot be used because it is the broadcast address. The zero address cannot be used because it is used to specify a network without specifying a host. The broadcast address is to s used to broadcast a message to every host on a network. For a subnet of /24, the total usable addresses now becomes 254. If my subnet is /8, then I have 8 bits as my network portion and 24 bits that are my host portion. 24 bits can hold 2^24 values. There are 16,777,216 total addresses in my network. To get the total usable addresses you subtract 2 because there are 2 "special" addresses that cannot be used. To be specific in this example: 210.0.0.0 cannot be used because it is the zero address and 210.255.255.255 cannot be used because it is the broadcast address. For a subnet of /8, the total usable addresses now becomes 16,777,214. The higher the number for your subnet, the less IP addresses you get. A /24 will have much less IP addresses than a /8, as seen above. What if the subnet isn't a nice number like 255 or 0? If you network IP address is: 210.10.10.0/23. We have 23 bits in the network and 9 bits in the host. If my subnet is /23, then I have 23 bits as my network portion and 9 bits that are my host portion. 9 bits can hold 2^9 values. There are 512 total addresses in my network, minus the 2 "special" addresses you get 510 as the total usable addresses. "The unusable zero address is where the host portion (yellow highlight) is all 0's. The unusable broadcast address is where the host portion (yellow highlight) is all 1's." To be specific in this example: 210.10.10.0 cannot be used because it is the zero address and 210.10.11.255 cannot be used because it is the broadcast address. Big Picture: What is IPv4 vs. IPv6? IPv4 stands for Internet Protocol version 4 and what we have been talking about above in this article (everything above related to IPv4 only). IPv4 uses 32 bits for its Internet addresses (which we mentioned), and can allow for 2^32 IP addresses total (4.29 billion). However, all of these 4.29 billion are assigned and we have run out. IPv6 is the sixth revision to the Internet Protocol and the successor to IPv4, and it is 128-bit addresses so 2^128 addresses (a lot more than 4.29 billion). IPv6 is based on the hexadecimal system. Why don't we all just go do IPv6 now? Only a small fraction of the web has switched over to the new protocol, Azure and other cloud providers are still mostly utilizing IPv4. Also, exchanging data between IPv4 and IPv6 requires special gateways which makes it hard to support only partially moving over to the new protocol, and most companies have legacy systems, software, and networking-- so it could be awhile. What is a reserved IP address? There are some IP addresses that you cannot use because they are not allowed to be used by the Internet Engineering Task Force (IETF) and the Internet Assigned Numbers Authority (IANA). See a list of reserved IP addresses and what they are each set is reserved for on Wikipedia here.